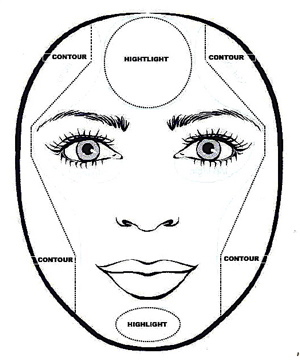 Contour your temples, cheeks & jawline to create the illusion of an oval. Highlight your forehead, under your eyes & your chin to draw attention to the center of your face. to make a face look less rounded, accentuate the hollows of the cheekbones. highlight above cheekbones using your foundation. then lightly dust bronzing powder underneath. slick on a lipstick that is slightly darker than your lips to add more light to the center of your face. oval is considered the ideal face shape due to its balance and symmetry, so if you fall into this category, contour is not needed. you can experiment with most makeup trends without error. If your face is oval, highlight your bone structure, paying special attention to your cheekbones. work with your regular shade (or a shade slightly lighter) of foundation and bronzer. blend the foundation just above your cheekbones and apply a bit of the bronzer to your forehead and directly under cheekbones for a sun-kissed glow. 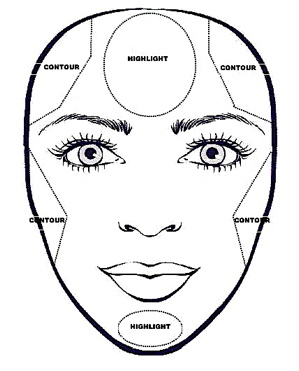 Contour at the temples and cheeks to diminish the width of your upper face. Highlight your forehead, under your eyes and your chin to draw attention to the center of your face. blend bronzing cream or powder around the jawline at the chin, to make the area appear to recede. then apply it under cheek bones to reduce fullness at the cheeks. 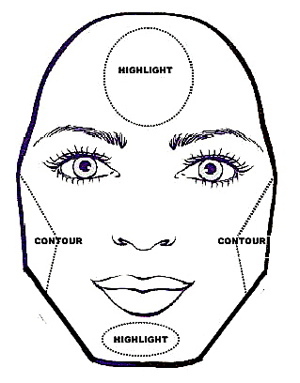 Contour the corners of your forehead & lower jaw blending up to the bottom of your ear. 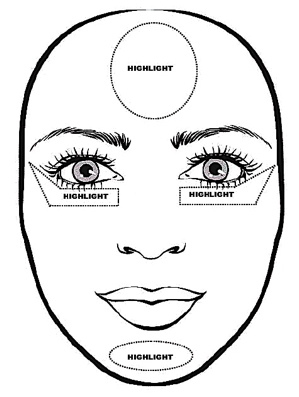 Highlight the center of your forehead, under your eyes & chin to draw attention to the center of your face. you want to soften your jaw. dust bronzing powder across the entire jawline, then dust with loose powder. the slight darkness this creates will make the area appear to recede. personally, I find the square-shaped face the most striking as long as the jaw doesn’t appear too strong. 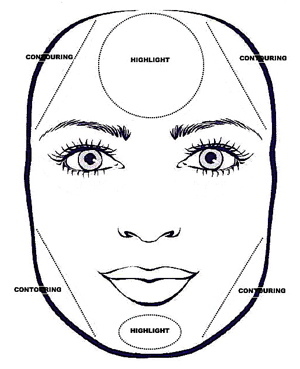 Contour at the cheeks to minimize width. apply a slightly lighter shade of foundation at your temples and jawline to make them appear broader. apply blush to the apple (ball) of your cheek, no lower than the bottom of your nose, and blend towards the center of your ear. Contour across the lower section of your chin to shorten your face length. Highlight the apples of your cheek to widen your face. 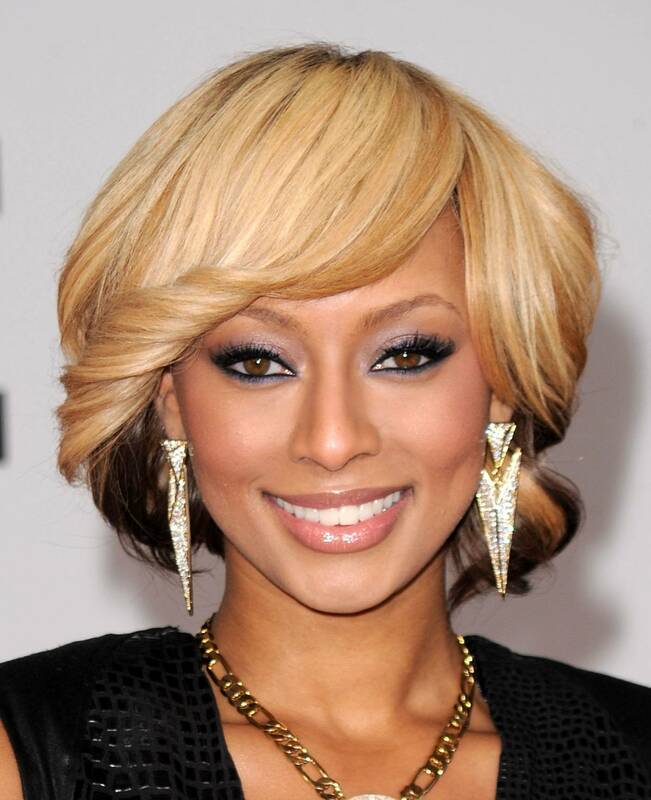 for an oblong face, contour the sides of the jaw, temples and hairline with bronzer to minimize a prominent forehead. highlight the chin and cheekbones. extending the eyebrows outward toward your temples also will soften the angular features. brow powder tends to create a far softer brow line than pencil. next time I’ll offer color suggestions for highlighting various skin tones. so, what do you think about this post….do you know your face shape? If so, what tips or tricks do use to contour & highlight your bone structure? You have a great face shape, by looking at your pic I’m thinking round or maybe heart. 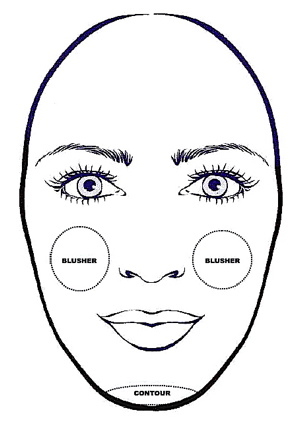 I’ve updated this post with two resources for determining your face shape..check em’ out! Thanks! From the quiz I think it’s either diamond or heart. I should ask a professional! This entry was posted on February 27, 2012 by suite7beautytalk in Uncategorized and tagged contour, face shapes, heart-shaped, highlight, oblong, oval, round, square.